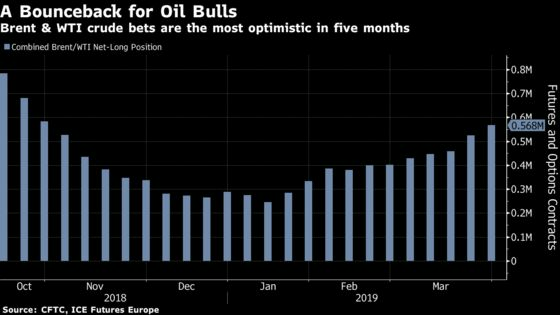 (Bloomberg) -- Oil extended its best-in-a-decade rally as Chinese manufacturing data and fresh evidence of OPEC supply cuts fed into the bullish outlook for prices. Futures in New York added 2.4 percent on Monday, after finishing their strongest quarter since 2009. A gauge of Chinese factory activity saw its biggest increase since 2012, easing worries about the global economy. Meanwhile, OPEC’s output slipped in March for the fourth straight month, led by deep production cuts in Saudi Arabia, according to a Bloomberg survey. U.S. oil prices rallied 32 percent in the first quarter as Saudi Arabia led the Organization of Petroleum Exporting Countries and its allies in squeezing supplies to prevent a glut. Unplanned losses from Venezuela and Iran have also helped prices rise, offsetting fears about slowing global growth. Meanwhile, Iranian Oil Minister Bijan Namdar Zanganeh said OPEC and allies could easily extend its agreement on oil-production cuts. Doubts that the OPEC+ alliance would be able to deliver have turned into confidence about a tightening market, at least for the time being. A Bloomberg survey of officials, analysts and ship-tracking data found output from OPEC’s 14 members fell 295,000 barrels a day to 30.385 million last month. Saudi Arabia carried much of the burden, slashing production to a four-year low. In Moscow on Monday, Iranian Oil Minister Bijan Namdar Zanganeh told reporters it “should be easy” to extend curbs into the second half of the year, after a meeting with Russian counterpart Alexander Novak. West Texas Intermediate for May delivery rose $1.45 to settle at $61.59 a barrel on the New York Mercantile Exchange, the highest level since November. During the session, WTI climbed above its 200-day moving average, yet did not close above the key technical level. Brent for June settlement added $1.43 to end the session at $69.01 a barrel on the London-based ICE Futures Europe exchange. The May contract expired Friday. The global benchmark crude was at a premium of $7.30 to WTI for the same month. China’s manufacturing purchasing managers’ index recorded its biggest increase since 2012 last month, exceeding all estimates by economists. The news lifted equity markets worldwide, with Hong Kong’s Hang Seng index entering into a bull market. Investors, meanwhile, are holding out hope for progress in the China-U.S. trade war. Chinese Vice Premier Liu He is set to travel to Washington to meet U.S. negotiators on Wednesday, and then sit down with President Donald Trump. Gasoline futures added 0.9 percent to settle at $1.8989 a gallon. Saudi Aramco was the world’s most profitable company in 2018, easily surpassing U.S. behemoths including Apple Inc. and Exxon Mobil Corp., according to an extract of the firm’s accounts published by Fitch Ratings. Italian oil field services firm Saipem SpA is in discussions to sell both its offshore and onshore drilling units.